Question: Dear Dee, Where is good place to go horse riding - where they take good care of their horses and the riders - on Cape Cod, preferably Western Riding? Dee's Reply: Hello, Eva - Horseback riding is a wonderful way to enjoy our beautiful Cape Cod scenery! I know of several stables that offer guided trail rides: Esperanza Riding Company and Ridge Valley Stables. Both farms receive very good reviews from their customers, and I believe both use western saddles on their trail horses. Sorry to say, Esperanza Riding Company is no longer offering horseback trail riding here on the Cape. Esperanza Riding Company has a variety of horseback riding options including 1.5 - 2 hour group and private rides, a 30-minute family ride on the farm in East Sandwich, 15-minute pony rides for small children, and custom tours (by special arrangement). Prices vary, based on the type and length of ride you choose. You can read all about Esperanza Riding Company here. Ridge Valley Stables isn't located on Cape Cod, but they do bring their horses to the Cape for trail rides. Ridge Valley offers full-day rides on the trails and along the beach at Sandy Neck - a beautiful beach on Cape Cod Bay. Prices vary for the day-long rides, depending on how many people are in your group. Click here for more about Ridge Valley Stables. I began riding when I was five years old, and I've been lucky to have my own wonderful horses to ride. (That's me in the photo at the top of this page.) So I've never used a guide service here on the Cape. But that's about to change! When I first heard about Esperanza Riding Company a few years ago, I was intrigued to learn that they use Paso Fino horses for their trail rides. Paso Finos are a breed that's known for their gentle nature and their unique, comfortable gait. I've always wanted to ride a Paso, but I've never had an opportunity to do it. 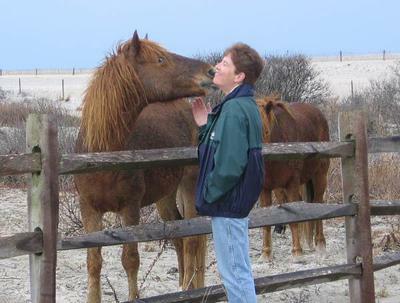 Thanks to your question, Eva, you've inspired me to take my first guided horseback ride on Cape Cod. When Esperanza begins their trail riding season in May, I'll make a reservation, go for a ride, and let you know all about it ... with photos and a full "ride report"! Thank you so much for your reply! My daughter Amelie was so happy when we just had a look at the websites. She also started horseback riding when she was 5 years old (and is now 13 years old ). In the off-season with light traffic conditions, it's approximately a one-hour drive from Truro to Sandwich. During the summer months, the drive time could be 90 minutes or more. Did you know there's also a whale watching cruise that leaves from Barnstable Harbor? Sandwich and Barnstable are adjacent towns. So if you decided to stay in Sandwich, you'd be near the horseback riding and a whalewatching cruise.